The Jaguar XE is sold with one of three different engine choices. The base engine available on the 25t trim is a 2.0L turbocharged 4-cylinder making 247 hp. Power is sent to the rear wheels via an 8-speed automatic. Jaguar claims that the base engine can hustle to 60 mph in under 6.5 seconds. Though Jaguar has not released fuel economy estimates yet, the 20d trim features a 2.0L 4-cylinder turbodiesel, a relative rarity in the US. It is mated to an 8-speed automatic, but unlike the 25t, the 20d is available with all-wheel drive. Power is rated at 180 hp and 318 lb-feet of torque. The 35t is at the top of the lineup, and features a 3.0L supercharged V6 that is shared with the F-Type sports car. The engine makes 380 hp, enough to get the XE to 60 mph in under 5 seconds, while power is once again sent to the rear wheels via an 8-speed automatic. Like the 20d, all-wheel drive in an option on the 35t. The Jaguar XE returns for 2019 with a few additional features including a voice activated navigation system. It also gets a new "300 Sport" model which includes 19-inch wheels, sport seats with contrasting stitching and a dark satin grey grille. The Jaguar XE is the least expensive car in the Jaguar lineup, potentially opening up a whole new segment of buyers for the company. 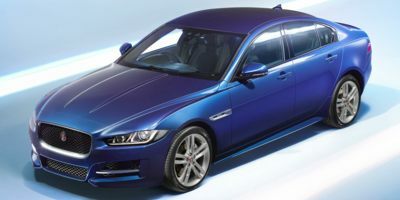 With a base price of under $37,000 the Jaguar XE competes with the BMW 3-Series, the Acura TLX and the Audi A4 all of which are priced in the same general ballpark. The Jaguar has clean, but aggressive styling and the kind of old-world charm that its competition can only dream of.